Up to the early 1920s, Japanese natural bristle toothbrushes with bone or wood handles came to U.S. drugstores in large unpackaged quantities exposed to dust and germs through routine handling. In response, an entrepreneurial wholesale drug sundry manager, J. T. Woodside, decided to produce a standard but hygienic toothbrush that would appeal to the masses. His new convex-bristled brush gained approval from Dr. George N. West, then dean of the Kansas City Dental College and president of the International Dental Association. Subsequently, the Western Company (Weco) was established and began churning out an unprecedented sterile alternative — Dr. West’s Toothbrush — that came wrapped in a sealed glassine envelope, to be superseded a decade later by a signature glass tube. In 1938, a long-standing collaboration between the two companies gave Weco exclusive rights to use DuPont’s new Exton nylon bristles and Dr. West’s Miracle Tuft brush was soon announced. Meanwhile the Florence Manufacturing Company, at that point going by the name of Pro-phy-lac-tic Brush Company, continued to produce their popular Pro-phy-lac-tic toothbrush with natural bristle until Weco’s exclusive franchise on the use of DuPont’s nylon bristles expired in 1940. Soon the Pro-phy-lac-tic toothbrushes were filled with synthetic bristles trademarked by Florence Manufacturing as Prolon. By the 1950s, 80 percent of all toothbrushes had nylon bristles, but the dental profession was still debating the benefits of natural verses nylon bristles. Despite competition among manufacturers to produce the most appealing and functional brush, surveys of use, conducted into the 1970s, indicated that most Americans bought only one toothbrush a year. 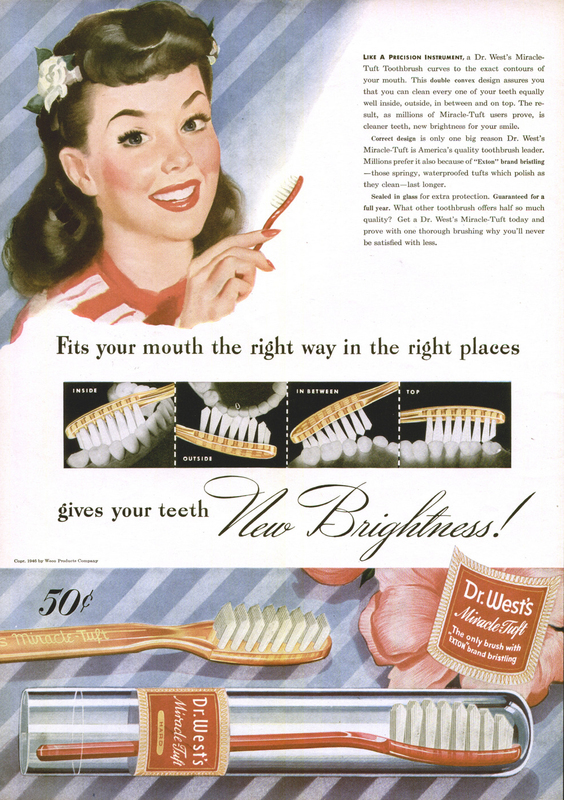 Segrave, K 2010 America Brushes Up, the use of marketing of toothpaste and toothbrushes in the twentieth century. Jefferson, NC: McFarland and Co. The Exton brand proclaims sterile cleaning precision and tooth brightness. The Prolon trademark touts uniquely beneficial fine, round-ended synthetic bristles.